Living in the south we always have bugs. The biggest problem we have are mosquitoes . Recently I was introduced to EcoSMART which are the makers of natural home and garden pest control. This really peaked my interest since I hate using the normal over the counter bug repellent on my kids when they play outdoors which is a daily thing this time of the year. EcoSMART sent me the Patio Bundle to try. How is EcoSMART products different: EcoSMART is the world leader in safe pesticide solutions whose mission is “To create the world’s safest, most effective pesticides based on natural ingredients.” They have 15 years of scientific research and a wealth of patents under their belts. 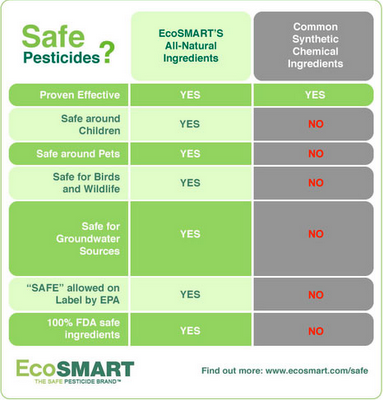 EcoSMART offers the only complete line of EPA exempt pesticides sold in the US and they are the only 100% safe pesticides proven to work. 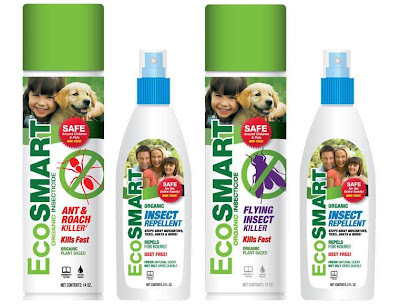 By using the basis that plants and trees have used their own oils as defense against insects and pathogens, EcoSMART uses the same essential plant oils. Steve (founder of EcoSMART) talks about spraying safe. Visit EcoSmart website and choose which of the Value Bundles you’d like if you win. One winner will be chosen ! I will be using a random number generator to select the winner. Contest ends at 11:59pm CST on 4/18/10. If the prize is not claimed in 48 hours a new winner will be chosen.Contest open to U.S. residents only (except AK & HI). I'd go with the Safe Patio Value Bundle. Thanks! I would choose the patio kit. I would love the Safe Plant & Garden Value Bundle. The Patio Value Bundle looks great. Thanks for the giveaway. I'd choose the Safe Home Value Bundle. I would probably pick the Home bundle. Thanks so much! Safe Personal Care Value Bundle is what I like! The Safe Lawn and Outdoor Value Bundle would be great for summer. I would like the Safe Home Value Bundle. Thank you! We just planted our garden and could use the Safe Plant & Garden Value Bundle. I would pick the home bundle. We get ants really bad during the summer and while I can deal with bugs outside, I can't deal with them inside! Safe Lawn and Outdoor bundle would be nice. April 16, 2010 at 10:58 PM This comment has been removed by the author. I would like the Safe Lawn and Outdoor Value Bundle. Safe Home Value Bundle would be my pick! http://staishasoverwhelmed.blogspot.com/2010/04/blog-post_2754.html Your button is on my blog. I would choose the Safe Plant & Garden Value Bundle. Thanks. I'd like to win the Safe Personal Care Value Bundle. Safe picnic value bundle for my family. I would pick the safe plant and garden value bundle. I would get the Home package! I would want the Safe Home bundle, as I have ants in my house. I would get the Safe Personal Care Value Bundle, thanks! Safe Home Value Bundle seems like the best to me. The collection I need most is the Safe Plant & Garden Value Bundle. We have a real problem with weeds and fungus in the yard, due to some flooding issues. I worry about using chemicals, though, because of the birds and squirrels. The Safe Home Value Bundle looks very useful!